The purple, 75' L-4E6S Star Quad XLRM to XLRF Microphone Cable from Canare is especially designed for handheld microphone applications in live sound, rehearsals and other situations. In addition to mic-level signals, the cable can also be used to carry line-level signals such as for connecting your mixer to power amps. The L-4E6S Star Quad cable features a 4-conductor design that is engineered to substantially reduce vulnerability to electromagnetic and radio frequency interference when compared with 2-conductor cables. It uses 21 AWG copper wire which features cross-linked, flexible irradiated polyethylene insulation, which is designed to maintain maximum frequency response and to be more heat resistant than ordinary polyethylene. It also utilizes braided copper shielding which is designed for greater noise rejection and durability than spiral shielding. The cable also includes cotton filler which is in place to help to cut down handling noise. This can be beneficial in handheld microphone applications in which the cable may be subject to a substantial amount of movement. 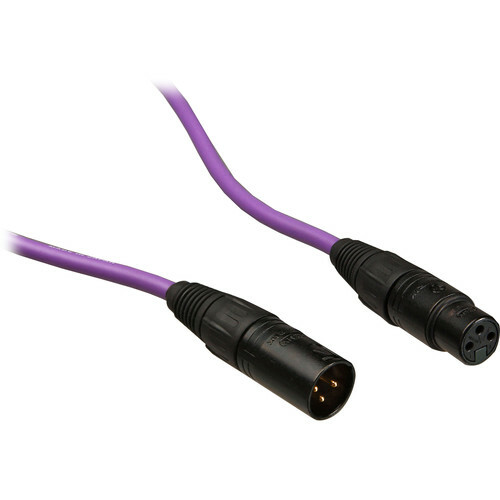 Box Dimensions (LxWxH) 8.4 x 7.8 x 1.6"
L-4E6S Star Quad XLRM to XLRF Microphone Cable - 75' (Purple) is rated 5.0 out of 5 by 2. Rated 5 out of 5 by KeytarsandCadillacs from Great product, great price Cables are well-built with high quality Neutrik connectors and come at an unbeatable price. Quad cables from competetors are nearly double. Rated 5 out of 5 by SoundguyMichael from Great Cables Canare is some of the best audio cable out there. Always get Neutrik ends.